Despite the unique biological opportunities presented by the island chains of French Polynesia, the biology of the area is poorly known. Moths are among the scores of large taxonomic groups that we know little about. From Darwin forward, biologists have used islands as natural laboratories to tease apart the intricacies of evolution. 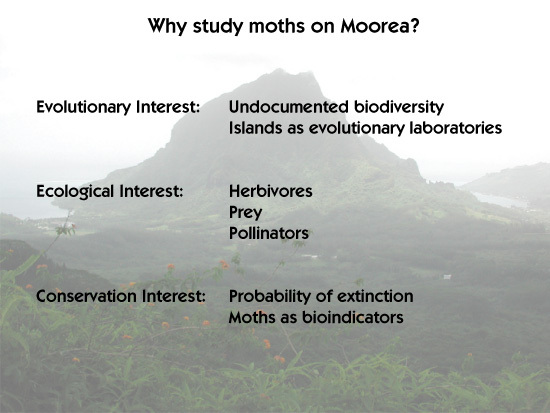 Each chance to explore undocumented biodiversity such as Moorea's moth fauna can lead to new evolutionary insights. Because human impact on the island is likely to result in the extinction of arthropod taxa, it is imperative that we learn what we can from these organisms soon. Moths play important roles as herbivores during their larval stage, as pollinators during their adult stage, and as food for predators and parasitoids throughout their life cycle. There is no information on how moths perform these roles on Moorea.